It probably comes as no surprise to regular readers of this blog that mushrooms are one of my favourite vegetables (sorry, edible fungi). I am also quite partial to risotto, which is probably less obvious. 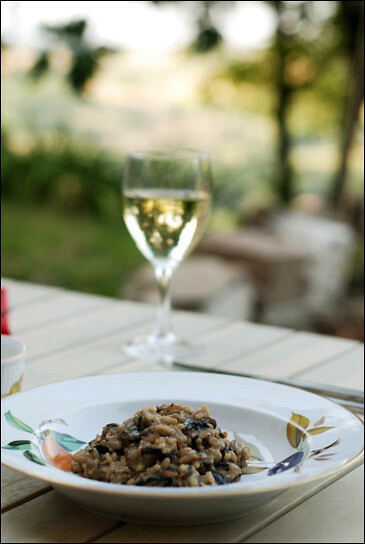 So what better than to combine the two and create a delicious mushroom risotto? I made this as a starter for dinner one evening - I don't normally do starters as they are too much faff - and I think it was worth the effort. The photograph doesn't really do it justice, but risotto is unfortunately not terribly photogenic. I was feeling decadent and went the whole hog with this one, using butter, parmesan and crème fraîche, but there is no need to show quite such flagrant disregard for healthy eating - the butter can be subsituted for olive oil, and the parmesan and crème fraîche left out altogether if you wish. It can also be made vegetarian by subsituting chicken stock for vegetable. It helps to get all the ingredients prepared before starting to cook with this dish, so weigh out your rice, finely chop the shallots, thinly slice the mushrooms and peel the garlic ready to crush. If you like, you could also grate the parmesan too. Put half the butter in a large heavy bottomed frying pan and melt. Add the shallots and cook until soft, then crush in the garlic and cook for a further minute. Turn up the heat and quickly cook the mushrooms to seal in the juices, then add the carnaroli rice and the rest of the butter. Cook for a minute - this helps the carnaroli cook faster - turn down the heat then add about 2/3 of the chicken stock and stir. Keep an eye on it so it doesn't stick, but try not to stir too frequently. Add the wine, season with a little salt (don't use too much, as parmesan is quite salty. You might want to leave it out altogether at this stage) and pepper and let it simmer down again. It is worth noting that the cooking time for risotto rice can vary wildly between the different varieties. Before you add the remainder of the stock, it is worth tasting it to see how close to done it is. If it is slightly nutty but essentially soft, it is done. Add the crème fraîche and parmesan and away you go. If it is harder, add the remainder of the stock bit by bit, still stirring occasionally, then while the risotto is still slightly soupy (but not too wet - it's not meant to be a soup) stir in the parmesan and crème fraîche. Cook for a couple more minutes then serve.